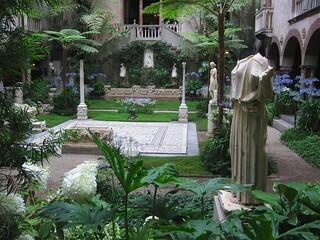 WeatherGrrrl and I spent a very enjoyable afternoon today at the Isabella Stewart Gardner Museum in Boston. Gardner collected a wide variety of (mostly European) art in the late 1800's and early 1900's, and designed and built a structure to serve as a combination museum and home. You're not allowed to take photographs in most of the galleries, which are an amazing, super densely packed flurry/jumble/blast of pieces. Unfortunately her will requires that nothing be moved permanently, so some rather questionable choices of placement can't be fixed. So many pieces are poorly lit (often very much so), others are placed too high to really see well, or are tucked in a niche that prevents you from gaining any distance, etc. Still it's a heck of a collection and quite an experience, reminiscent of the wonderful (and probably better arranged) Soane Museum in London. The one exception to the "no photography" rule was on the ground floor of the central courtyard. Gardner and her husband really loved Venice, and she designed the museum with a covered central courtyard. The interior walls facing the courtyard were designed to look like the outside of a Venetian palazzo, overlooking a positively tropical profusion of plants and Mediterranean art. If the interior galleries were often frustrating, the courtyard was simply splendid every time you came back to it. Most of the rooms in the upper floor had windows that looked out over the courtyard, and because the whole system is sealed, those windows could be open to the "outside" without risking the weather, birds, bugs, or other Things Not Nice To Fine Art. Quite wonderful.